Several years ago Parker O-ring produced a brochure that spoke about a Los Angeles Superior Court awarding $58 million in damage to a worker who was injured as a result of a defective o-ring. Through a search I learned that the male employee had been suffered severe burns. The piece I found states that this was the largest personal injury verdict in the state of California. The Parker article states that both the Company importing the o-rings and the company distributing the o-rings were found guilty of negligence. Most o-rings cost pennies but this is the only example you'll find that o-rings cost $58 million. More importantly, the suffering that the plaintiff in this case went through. There is a term that is used in the o-ring industry that often refers to o-rings as "black and round". I caution that you think twice before considering cutting cost with the "black & round" component of your products. The gasket or seal component of a product is often an after thought. It is the 11th hour of design and an engineer realizes that they need a gasket or seal. 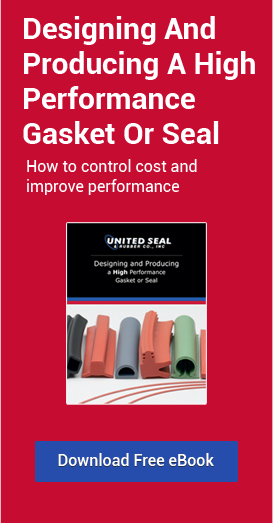 Typically the gasket or seal is a small percentage of the overall cost of the product. However, as demonstrated in the above paragraph the wrong seal can prove to be very costly. Shifting back to the black and round conversation and Parker found that as much as a 75% difference in compression set resistance between Parker o-ring compounds and other o-ring materials. Twenty-two NBR (Nitrile or Buna-N) and FKM (Fluorocarbon) compounds were compared in a variety of fluid immersion, chemical, and physical property tests. Included in the test were Parker's N1470-70 (70 durometer NBR) and V1164-75 (75 durometer FKM) globally produced compounds. Over the years I have seen folks who believe that NBR, FKM, EPDM, FFKM, etc to be all equal. However, this is a myth that is untrue and can be a costly mistake. How can one manaufacturer's compound differ from another? The compound base is the polymer family (i.e. NBR, FKM, EPDM, etc.). However, some manufacturers will "cheapen" their materials through changes in their formulation. This is what is known as the "fillers" that is added to the base polymer. Secondly, they may "cheapen" their material by shortened molding cycles. When you specify and purchase a Parker O-ring from United Seal & Rubber you can rest assure that the manufacturing process is one that offers a consistent material formulation. And the mixing and molding processes are developed and consistent with state-of-the-art controls. Finally, Parker provides a registered Certificate of Conformance from their factories to ensure you are getting the Parker product you specified. Does your current supplier offer the same? Do you know that you are getting a consistent product every time you order it? Finally, is it worth the savings to take a chance on cutting a small percentage of the total cost of your product? Or are you taking chances that at the end of the day, seal failure will end up costing you more? Aside from the extreme legal cost mentioned in the first paragraph, a failed seal can cost; product failure, expensive product recalls, and lost of market share (brand erosion). I know of an example where a manufacturer changed a material formulation without informing their customer. The end user experienced failures in the field, resulting in a massive recall of their product. The recall cost this company over $1 million dollars and is a great example of a supplier trying to "cheapen" their cost by small tweaks in their formulation or process. It is best to find a supplier who understands your material specifications and can provide a Certificate of Conformance that demonstrates you are getting the compound you have tested and specified. Be careful that the Certification of Conformance you get specifies that you are getting exactly what you ordered. For example, if you order N0674-70 compound make sure the C of C states that specific compound. I had a customer who ordered a specific compound only to find that what they were getting was an "equal compound" a year into their project. Thank goodness, this didn't cost them 6 or 7 figures but it did cost them around $15,000 plus several unhappy customers. In closing, please be careful in the selection of the seal, o-ring or gasket that you will use for your application. What appears to be a savings can end up being a costly mistake!